An index based on population trends in a set of wild bird species has been adopted by the UK government as one of its fifteen headline indicators for ‘Quality of life’. Over 32 years, the index shows that farmland birds have declined dramatically, reflecting a severe deterioration in the quality of farmland habitats. An index based on population trends in a set of wild bird species has been adopted by the UK government as one of its fifteen headline indicators, out of a set of 150 core indicators of sustainable development. Such an index has resonance with policy-makers, politicians and the public alike. It also meets the key attributes of an effective bio-indicator, being quantitative, simplifying, user-driven, policy-relevant, scientifically credible, responsive to change, easily understood, realistic to collect and amenable to analysis (Gregory et al. 2003). Data for the index come from a wide range of sources in schemes co-ordinated by c.12 national organisations and are mainly collected by volunteer observers. Over 32 years, the index (see figure) shows fluctuating but largely stable populations over the whole set of 106 breeding bird species. However, farmland birds have declined dramatically. This reflects a severe deterioration in the quality of farmland habitats, affecting both birds and other elements of biodiversity. Such habitat degradation does not relate to the rarest species, nor to Special Protection Areas (both of which are critical elements of biodiversity); rather, it relates to biodiversity in the wider countryside. There is good evidence that this decline is due to widespread intensification of agriculture. Woodland birds also show a substantial, though less precipitous, decline, suggesting that woodland habitats are also in trouble. 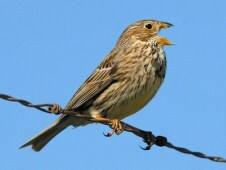 A similar composite index for farmland birds has now been developed for Europe as a whole. Gregory, R. D., Noble, D., Field, R., Marchant, J., Raven, M. and Gibbons, D. W. (2003) Using birds as indicators of biodiversity. Ornis Hung. 12-13: 11–24.